Here's step by step guide on how to create AWS cli command line interface. It will ask you for access ID and secret access ID, You will have to provide AWS Access Key ID and AWS Secret Access Key are your account credentials. How to create aws access key ID and secret access key. 1. Open the IAM console. 2. In the navigation pane of the console, choose Users. 3. Choose your IAM user name. 4. Choose the Security credentials tab and then choose Create access key. 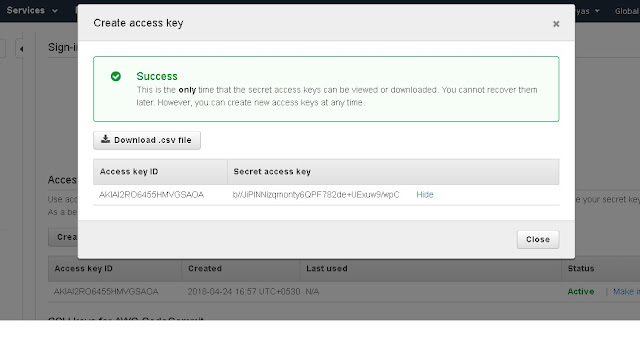 The only time that you can view or download the secret access keys is when you create the keys. You cannot recover them later. So in the next post i will explain you how to use AWS cli for AWS resources.